This beautiful pattern is new for July 2015. 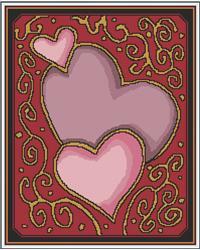 Luxury Of Love is the result of artist and cross stitch designer working together to produce this fun and easy to stitch pattern. The chart and measurements have been calculated for stitching on 16 count aida fabric. This chart contains full stitches only, and this would be categorised as an easy/medium piece. There are nine colours in this design. The finished design will measure 190 x 238 stitches, (approximately 12" x 15"). Fabric size needed is 18" x 21". This will leave 3" all round for framing or creating something out of your finished piece. You can, of course, use a different count of fabric, so your finished size will be different. Project Size: 12" x 15"